This book has only recently been published. I thought you would like to have a copy so I got it for you. Hope you enjoy reading it. Dr. Khanna, a staff member here, has edited the book. PS 1. Thank you & Ron for the card. 2. Tell Tom Weaver about the book since he is interested in this area too. 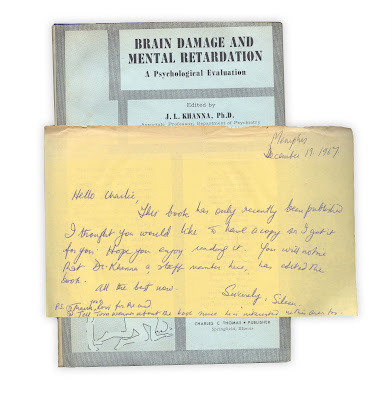 Found in "Brain Damage and Mental Retardation" edited by J.L. Khanna. Published by Charles C. Thomas, 1968. Sara, you might just be Forgotten Bookmarks' first intern. I have tons of interesting old letters and stuff, I just can't read them. You also forgot "like" in this sentence... "I thought you would (like) to have a copy"
LOL, sorry. Not so much a critic as the letter writer's script is a bit difficult to make out. Saying that... I believe the 5th sentence is, "You will notice that Dr. Khanna, a staff member here, has edited the bool." :) Many years ago, when I was in the 6th grade I used to help my teacher grade papers because of my uncanny ability to decipher difficult handwriting. It's amazing just to think about the actual moment letters like this were being written..Like a mental time machine. Not sure if that made any sense, haha.